Do you sometimes find that there are certain YouTube videos you seem to watch over and over again? Maybe instead of constantly streaming them you’d like to be able to save a copy on your hard drive – so you can watch it offline, or on some other device? Technically YouTube doesn’t have a feature for you to ‘download’ its videos. However it is possible to copy them directly from your screen then save them using Movavi Screen Recorder – which amounts to the same thing. If you’d like to try it out, first you should find the YouTube video you want to copy and open it – but pause it before it starts to play. Then launch Movavi Screen Recorder, and click and drag the mouse cursor to draw a frame over the video. 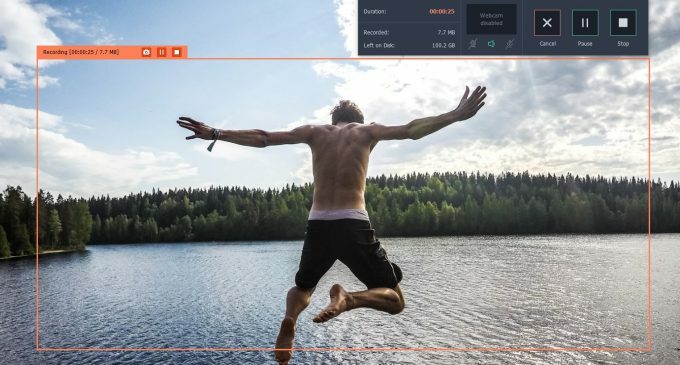 If you intend to record the video while it is playing in full screen, you can click anywhere then select your monitor name in the list under the ‘Capture Area’ section of the interface. To set Movavi Screen Recorder so that it captures audio from only your speakers, check that the ‘System Audio’ icon is highlighted – but the ‘Microphone’ icon isn’t. Just click on either icon if you need to toggle it. In the event that you don’t want to manually control the recording and would like to start it and leave it to record, you should click the ‘alarm clock’ icon and set a timer to stop it after a fixed duration. Alternatively you could rely on the manual controls on Movavi Screen Recorder’s interface. Once you press ‘REC’ to start recording, you’ll have a delay of 3 seconds that you can use to play the YouTube video. Afterwards when the recording is complete you can review it and trim out any unwanted parts from the video – so you don’t need to worry about being too accurate. That is really all that it takes to copy YouTube video. It may be worth your while you explore the other features in Movavi Screen Recorder and see just how much you can adjust the recording parameters or capture keyboard and mouse actions. Be sure to try out Movavi Screen Recorder and use it to copy a video. By doing so you’ll be able to see for yourself just how quickly and easily it can be set up, and will likely be able to do so even faster in the future.